As we are designing few resorts in western ghat, need for reference-inspirations of landscape which have minimal effect on existing ecology occured. 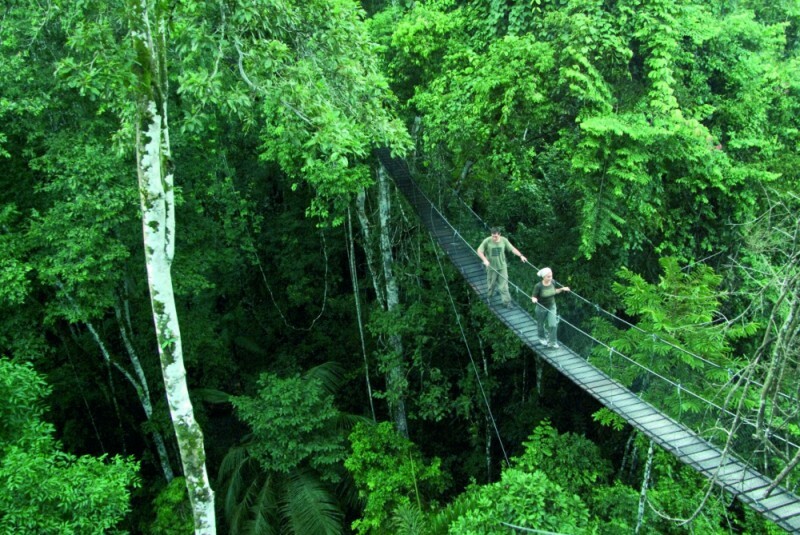 we came across few of the canopy walk project while searching for inspiration. here are few of them. 1. 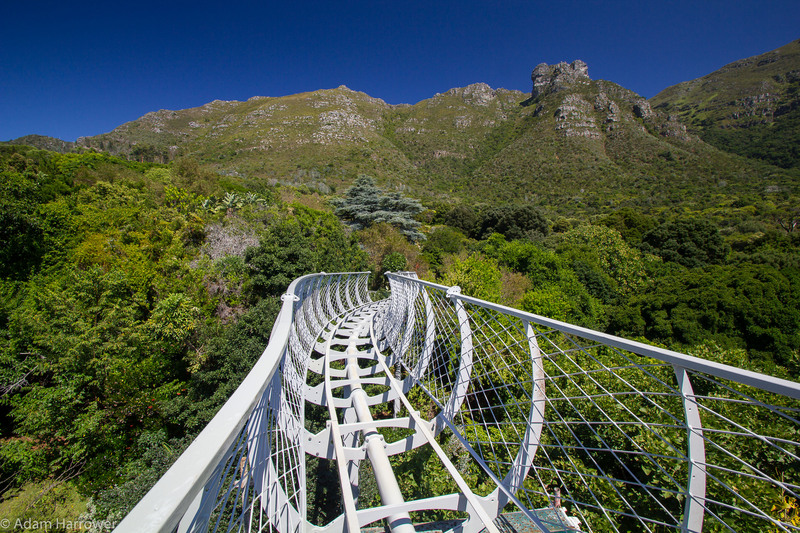 Kirstenbosch’s Centenary Tree Canopy Walkway (or boomslang) is 130 metres long; this is shorter than the original idea for the walkway (steel is expensive), but the visual and experiential impact the walkway has on one is nonetheless substantial. 2. The architect, film maker and resident botanical horticulturist involved in the design of the walkway spent hours plotting a route through the arboretum, taking the slope, existing pathways, mature trees and their longevity into account (the original idea for a walkway, way back in 2005, incorporated two huge pigeonwoods that have subsequently both died). 3. 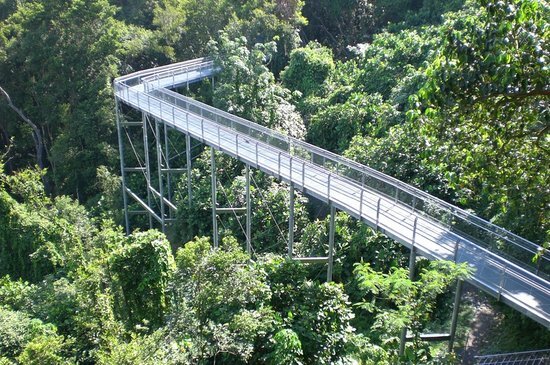 Many people get lost whilst trying to find it, despite its size and girth (19.6 tons of steel, 5.36 km of steel rod, 12 columns and 23 sections of walkway). 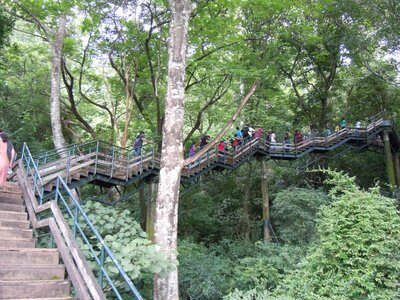 The aerial walkway is so naturally designed, and so ingeniously disguised in amongst the trees, that it remains hidden. 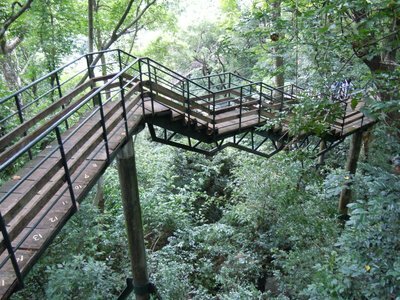 (To find it: head to either the ‘Enchanted Forest’ or ‘van Riebeek’s Hedge’ and turn to look into the overgrowth). You should see the start of the walkway ahead of you. 4. 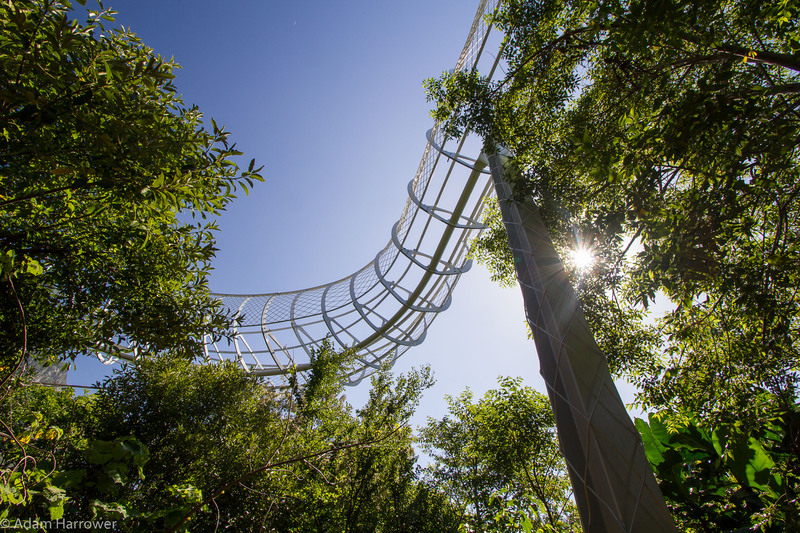 Translating the design of the inverted skeleton of a snake from the computer Sketchup renderings in to a valid real-life structure took the ingenuity of one of the best structural engineers in the country. 5. 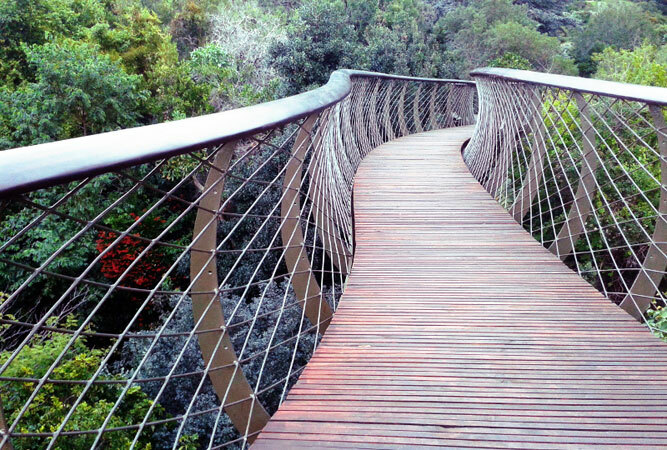 There are over 400 trees in and around the walkway – the intention of the walkway is to be botanically diverse, and so its path brings one as close as possible to hard pears, white stinkwoods, Cape saffrons and a grove of tall forest myrtle quince, avoiding trees with short life spans like the keurboom and pigeonwood. 6. 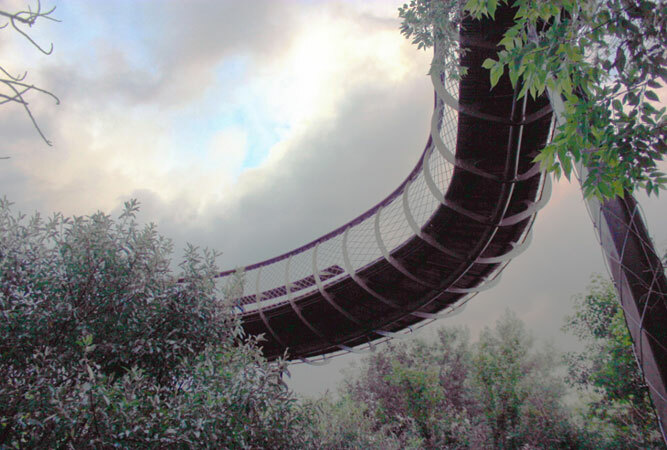 As its name suggests, the canopy was meant for the tree tops, but as the ‘forest’ in which it stands is little more than twenty five-years old (adolescent in forest age speak) and many of the trees no higher than seven metres, the walkway rises out and above the treetops and incorporates the views (Castle Rock, in particular, is seen from a vivid angle). 7. 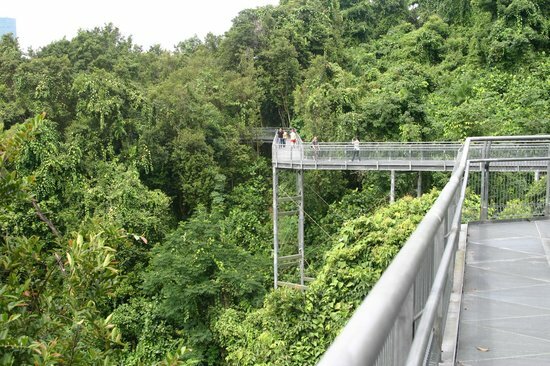 The walkway reaches a height of 12 metres, three-storeys, above ground. 8. Work began in July/August 2013 with the erection of the heavily-reinforced concrete foundation pads and stub columns, onto which the huge support columns were bolted. 9. The walkway has a lot of give and sways when there are more than a couple of people on the structure. Whilst this can feel a little daunting, it’s all part of the design (although when you look at it from underneath, the give is really quite substantial!). 10. African padauk, used more often for making musical instruments, was the wood of choice for the walkway, and most of the wood work was installed once the steel structures were all in place (getting the skeleton together, though, had its difficulties). 11. From beneath the structure, it looks even more like a snake, with ‘spine’ and curved railings that look a lot like a ribcage. Even the diamond-shaped steel mesh that acts as a safety measure, looks like the scales of a snake. 12. 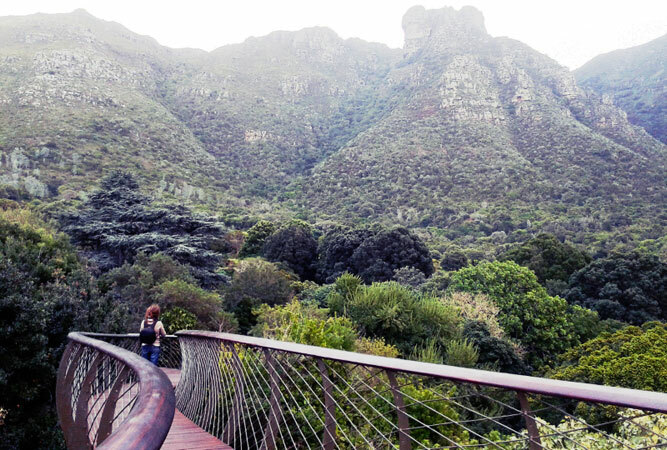 It is free to visitors inside the garden (included in the entrance fee for Kirstenbosch). 14. It’s perfectly safe (this is not a theme-park ride, but a carefully designed and constructed walkway above the gardens) for all ages.